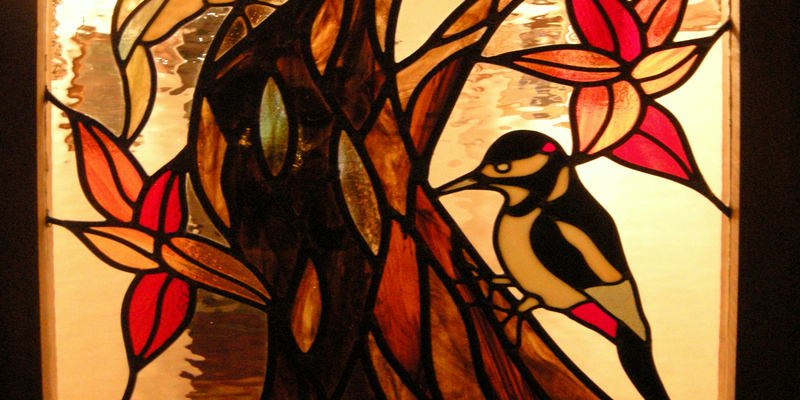 This stained glass door panel was a commission made for a private residential premises. 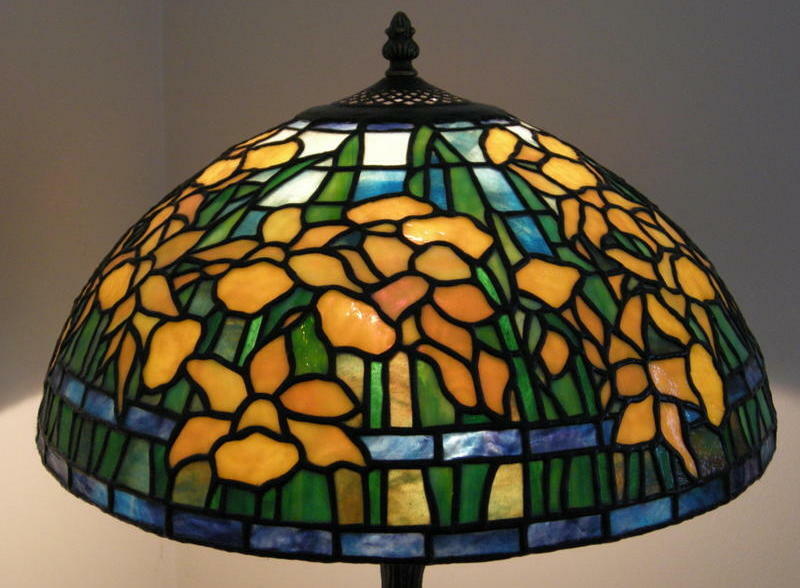 Once the design was drawn up and agreed the glass colours/textures were chosen and agreed with the customer with the use of bright and vibrant colours within the design. The panel is situated internally therefore I decided to construct the panel using the copper foiling method to enhance the details within the tree design to shine both artificial and natural light against the colours and textures of the glass (as you can see in the pictures from the different light sources). The words "Ten Feet Tall" is a family saying and is incorporated within the design at the bottom of the panel. Here is a selection of six pictures which have been taken from the same camera (so no trick photography or computer enhancement) at the same camera settings but with the benefit of different light conditions and positions, as you can see in the pictures above. This panel really does change from which ever position you view it from. 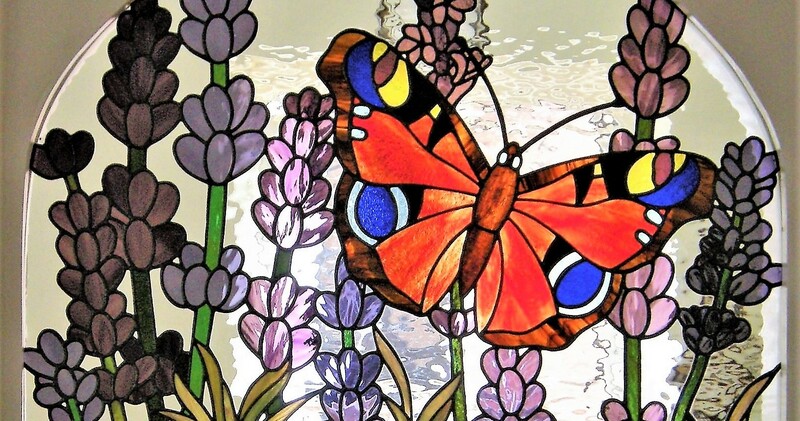 The design, artwork, pictures and images are copyright to Witney Stained Glass 2014. Neil, thank you for capturing so wonderfully our family motto..how to make people feel "Ten Feet Tall". I knew I wanted a tree to represent our family, with strong roots and lots of rich green leaves, but my challenge was the love of the colour blue and our motto, which I didn't want displayed obviously. However, it wasn't a challenge to you! I love the way you incorporated "Ten Feet Tall", intertwined with the leaves, which reflects how we live our value day by day....but what has truly blown me away is how you have given me not one tree but two, depending on how the light hits and the time of day. The use of iridescent glass has enabled me to have the pleasure of a blue/green tree and we love it! !